He was born on June 10, 1939, locally to Goodwood at Pulborough, West Sussex, where his father, Wally Harwood, had established a petro-chemical manufacturing business and the car dealership Harwoods eight years earlier. Harwood, who was educated at Stowe, signed a three-year engineering apprenticeship with a firm in Dartford upon leaving school, with the intention of joining the family business, but he developed a love of racing during that time when staying with the famous Winter family at Southfleet. He began riding out at for Ryan Price at Findon and, aged of 18, opted for a life with horses, riding 40 point-to-point winners along with14 under National Hunt Rules over the next few years. He started working as pupil assistant trainer to Bryan Marshall when he was 21 and, five years later in 1965, he commenced training under permit. That year also saw the sale of the family engineering business, as well as his marriage to Gill Lawson. Harwood first took out a full licence to train in 1966 after initially training jumpers for a year under permit. He proceeded to establish Coombelands stables at Pulburough as a state of the art training complex and succeeded in attracting some of the finest horses and biggest owners in the world. Acrania won the Jockey Club Stakes in 1967 and six years later the trainer announced his arrival at racing's top table when Jan Ekels landed the Queen Elizabeth II Stakes at Ascot, a race he would go on to win thrice more with To-Agori-Mou (1981), Sackford (1983) and Warning (1988). His association with Goodwood racecourse, which is but a short hack across the downs from Pulborough, is well established, and his big-race victories at his local course include two wins in the track's showpiece contest, the Group One Sussex Stakes. 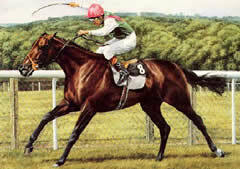 Harwood's first success in the great race came in 1985 with Rousillon, winner of the Queen Anne Stakes and Prix du Moulin that same season, who swept to the lead inside the final furlong under Greville Starkey to record a two and a half length verdict over Bairn. The second of Harwod's Sussex Stakes triumphs was with the brilliant Warning in 1988, who had landed the Richmond Stakes at Goodwood the previous year. The Khalid Abdulla-owned three-year-old, ridden by Pat Eddery, went clear of Then Again by a length and a half victory in the mile championship event. Overall Guy Harwood trained 116 winners at Goodwood, including at least two trebles on a day’s racing here and enjoyed more 32 winners during Glorious Goodwood. His initial Classic triumph came in 1981 when Recitation captured the Poule d'Essai des Poulains and a week later To-Agori-Mou captured the 2,000 Guineas at Newmarket to give him the first of his two English Classic wins. The second came in 1986 when the great Dancing Brave took the same Newmarket Classic in scintillating fashion. Dancing Brave was the best horse to grace Coombelands and Harwood did a masterful job in priming his exceptional charge for a string of top-level triumphs that included the Eclipse Stakes, King George VI & Queen Elizabeth Diamond Stakes and the Prix de l'Arc de Triomphe but sadly not the Derby in which he finished fast to take second. Other stars to have benefited from Harwood's expertise include Kalaglow, winner of the King George VI & Queen Elizabeth Diamond Stakes and Eclipse Stakes, dual Ascot Gold Cup winner Sadeem, Lockinge Stakes and Prix Jean-Prat victor Young Generation, Allez Milord, Prix Jacques le Marois and Champagne Stakes winner Lear Fan, Cacoethes, Ela-Mana-Mou, Polish Patriot and Brocade. As well as horses, there were a stream of talented people who started off with the trainer or were connected with the yard such as jockeys Greville Starkey, Ray Cochrane, Tony Clark, Chris Kinane, Wendyll Woods, Nigel Hawke, bloodstock agent James Delahooke and trainers to be like Guillaume Macaire and Steve Hall, His brother-in-law and assistant Geoff Lawson was one of many who helped contribute to the success of the yard as did loyal staff like Tommy Townsend and Martyn Windsor. Harwood handed over the reins at Coombelands in 1996 to his daughter Amanda Perrett in order to focus his efforts on the family business, of which he is chairman and indulge in hobbies like bridge.